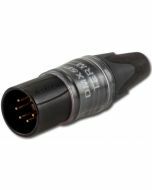 The DMX Terminator plugs into the XLR feed-through connector of the final DMX512 device on a control cable. 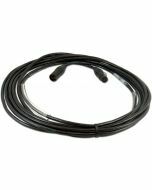 It improves signal reliability by preventing reflections and reducing ringing. A "happy" LED indicates a strong signal. Three Tranzorb transient-absorbing diodes suppress spikes caused by electrical storms. Radio frequency interference (RFI) is bypassed to chassis by the .001μF capacitance of the Tranzorb diode. Read Why Terminate to learn why terminating DMX512 lines is so important. 0.8" x 0.8" x 1.92"